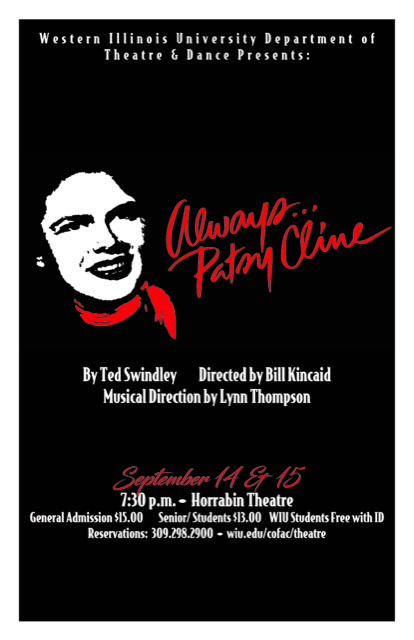 MACOMB, IL – The Western Illinois University Department of Theatre and Dance will present "Always…Patsy Cline," at 7:30 p.m. Friday-Saturday, Sept. 14-15, in the Horrabin Hall Theatre, as a fundraiser for the WIU Department of Theatre and Dance. The musical theatre production was created by Producer Ted Swindley and is being directed by WIU Theatre and Dance Professor Bill Kincaid, with musical direction by Associate Professor of Music Lynn Thompson. Lysa Fox, head of WIU's Musical Theatre program, will be starring in the production. 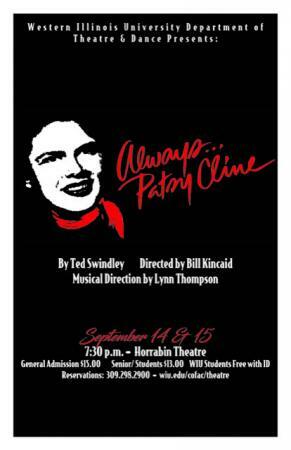 The performance is based on the true story of Patsy Cline's friendship with Houston housewife Louise Seger. The two women struck up a friendship at one of Cline's Texas shows, which resulted in Cline spending the night at Seger's home. The friendship lasted until Cline's death in a plane crash in 1963. The event is a fundraiser for the WIU Department of Theatre and Dance. General admission tickets are $15, with seniors and youth admitted for $13. WIU students will be admitted free with valid student identification. For tickets, visit westernpresents.com/ or call (309) 298-2900.